Classification after McKinney & Jackson 1989. Boardman, R. S. 1998. Reflections on the morphology, anatomy, evolution, and classification of the Class Stenolaemata (Bryozoa). Smithsonian Contributions to Paleobiology 86:1–60. Jablonski, D., S. Lidgard, and P. D. Taylor. 1997. Comparative ecology of bryozoan radiations: Origin of novelties in cyclostomes and cheilostomes. Palaios 12:505-523. McKinney, F. K. and J. B. C. Jackson. 1989. Bryozoan Evolution. Unwin Hyman, Boston. McKinney, F. K., S. Lidgard, J. J. Sepkoski, and P. D. Taylor. 1998. Decoupled temporal patterns of evolution and ecology in two post-Paleozoic clades. Science 281:807-809. Ryland, J. S. 2005. 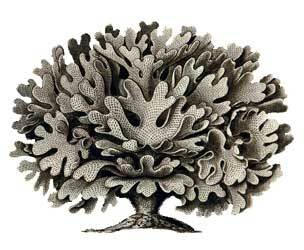 Bryozoa: an introductory overview. Pages 9-20 in: Moostiere (Bryozoa). E. R. Wöss, ed., vol. 16. Taylor, P. D. and M. J. Weedon. 2000. Skeletal ultrastructure and phylogeny of cyclostome bryozoans. Zoological Journal of the Linnean Society 128:37-399. 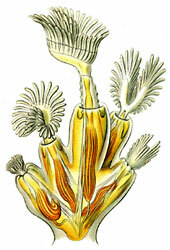 Introduction to the Bryozoa. UCMP Berkeley. The Paleobiology Laboratory. Joseph Pachut. Ernst Haeckel''s Kunstformen der Natur published 1899-1904 by Verlag des Bibliographischen Instituts, Leipzig and Vienna. 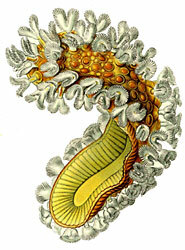 Young colony consisting of five zooids. Colonies of this species can creep through the water.